Whether your dog suffers from food allergies, environmental allergies or skin-contact allergies, the end result is inevitably the same – a pretty miserable pooch. Runny eyes, nasal discharge, irritated ears, paw licking and itchiness are all symptoms suggesting an allergy. 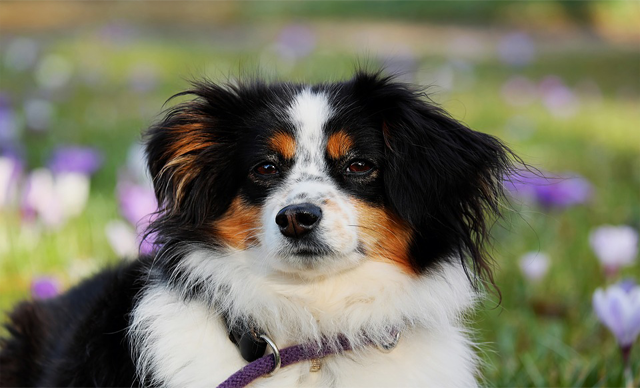 Regardless of the type of allergy your dog suffers from it’s triggered by an overreaction of your dog’s immune system. Basically, his body overreacts to certain substances that are either ingested, inhaled or come in contact with his skin. In order to fight these substances the dog’s body produces antibodies which cause certain cells to release histamine. Histamine is ultimately what plays the biggest role in triggering the inflammatory response seen in our four-legged companions. Most commonly, allergies are treated with prescription medications such as steroids and antihistamines. While effective, these drugs tend to only provide temporary relief and mostly mask the symptoms. On top of that, allergy drugs often cause annoying side effects. For example, using antihistamines like Benadryl can lead to unwanted drowsiness and urinary retention. Aside from this, owners are often frustrated because once these drugs are stopped their dog resumes the old itching and scratching cycle and they’re back to square one. Shutting down the immune system isn’t the real answer to the problem. This approach is ultimately a cover-up, basically the equivalent of placing a Band-Aid on an injury without fully treating it. Indeed, year after year the allergies get worse, not better. The real goal in treating a dog’s allergies from a holistic perspective is to balance and boost the immune system. Those interested in using alternative, natural remedies will be happy learning that Mother Nature’s pantry has some valuable resources. Natural remedies aim to enforce the immune system, reduce the inflammatory response, and in some cases, even suppress the production of histamine without ever needing to touch Benadryl. This natural remedy is known as “nature’s Benadryl” for many good reasons. Quercetin is a flavonoid found in many plants and is known to have potent antioxidant, anti-inflammatory and antihistamine properties. In addition, quercetin is also known for suppressing the production of certain inflammatory molecules responsible for triggering inflammation of the respiratory tract and bronchoconstriction. Quercetin supplements can be found in the form of capsules or concentrated powders. This enzyme is derived from pineapple. When added to quercetin, bromelain increases its bioavailability and works in synergy making it more effective. Bromelain also suppresses the production of histamine and prostaglandins. This enzyme is often added in quercetin supplements. Like quercetin, this natural remedy inhibits the release of histamine and its biologically active compounds lower the inflammatory response. Often used in the form of a tea or extract, nettle reduces itching, and best of all, it can help desensitize the body over time making the immune system less reactive according to veterinarian Sara Skiwski. These fatty acids support the immune system and lower the level of inflammation in the body. Fish oils, such as those obtained from wild salmon, krill, haddock and cod are great sources of Omega-3 fatty acids. Other beneficial sources are plant-based Omega-6 fatty acids found in evening primrose, blackcurrant seed oil and borage. Veterinarian Randy Kidd suggests a combination of both sources of fatty acids for a more potent effect. This healthy vitamin does more than prevent colds. When taken daily in the correct dose it helps lower the levels of histamine in the blood. More and more dog owners are reaping the benefits of adding coconut oil to their dog’s diets. Coconut oil contains lauric acid which can help to suppress the body’s inflammatory response. While oatmeal baths don’t cure allergies, it’s worth mentioning them because they work great for providing relief. A cool oatmeal bath is soothing to dogs with dry itchy skin and skin allergies. Brain Training For Dogs - Unique Dog Training Course! The Most Common Food You Should NEVER Cut From Your Diet!